I can't remember when I first heard that quote but I know it was many years and several homes ago. I like to think that I've pretty much managed to follow this "rule" when deciding how best to make our home attractive, welcoming and comfortable. 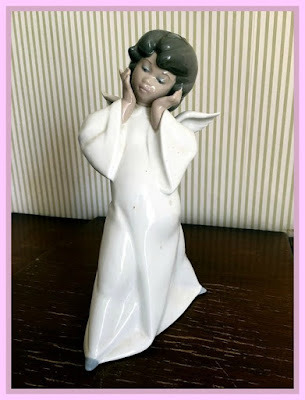 Over the years I've gathered together quite an eclectic mix of furnishings and collectibles and when browsing through blogland I know that I'm not alone! That's why I'd like to ask you something. What do you do with the things that no longer suit your style or taste? If there's a possible home downsizing in the not too distant future, what then? Are you ruthless and drop them off at the dump, donate to the local charity shop, sell them on eBay, or simply give them away to someone else to love? 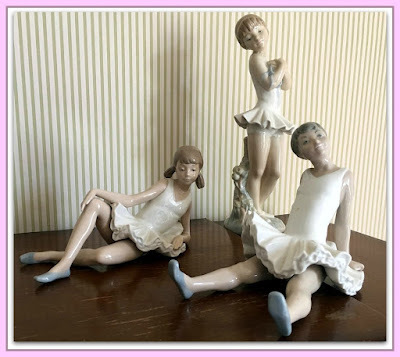 I bought my first Lladro Nao ballerina whilst on vacation on the island of Lanzarote in 1982 in fact we liked them so much that we bought three. Others soon followed and we began to receive Nao figurines as Christmas gifts from my family. I loved to display them on a sideboard in our small English cottage. When we went to live in Bavaria they suited the modern interior of our chalet style home, they even made it to Normandy when we moved to France in the mid '90's and that's when I fell out of love with them. They are too modern, too 1980's and just don't go in this ancient house. I took them out of the box to make my mosaic but they've been packed away again, to languish in a dark corner of the attic, until I've checked eBay to see if I'm sitting on a fortune! I'll let you know. 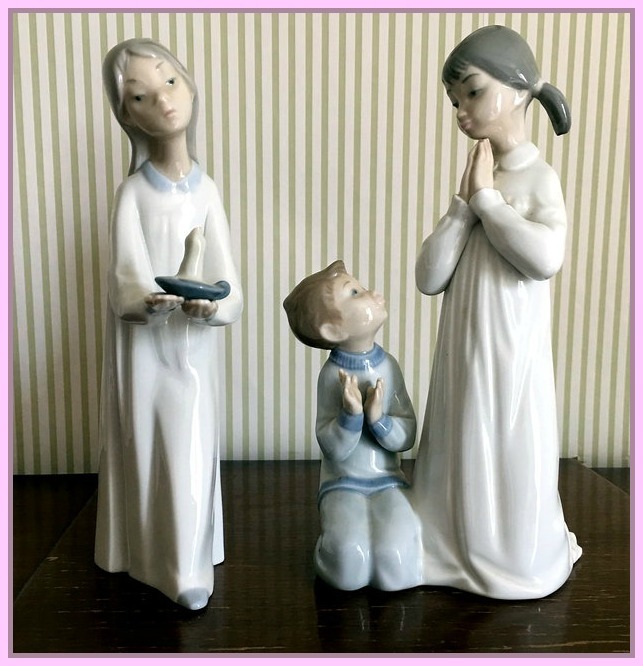 One of my sister in laws is a Lladro collector! Sadly, I do not believe that the younger generation collects objects such as these any longer and their present day value is nil. Perhaps E-Bay is the best way to sell them as die hard collectors may still want them. When I moved west in the US from NEw York City I had to dispose of quite a bit. I donated most to charity. Some sentimental collections still came with me, but like your Lladro they remain in boxes and I wonder why I still keep them? I had such items once and managed to sell them on eBay once a upon a time. Good luck with selling them. It seems a shame that someone else may not enjoy them rather than have them languish in a box. The quote calls to mind our down sizing. It still continues. I marvel at my past “need” for stuff. It only served to make me happy for a short time, the joy was fleeting. . .and now what do I do with it? If I’d only been less greedy I’d not be wondering what to do with it all today. God bless you on your “journey” as I know he will. We drastically downsized when we sold out to travel full time (lived in an RV for 10 years). Even though now we have two small homes I have almost (but not quite) kept to the motto of all full-time RVers which is way less elegant than your quote (as one might expect from trailer dwellers ;)))...”if you can’t wear it, eat it, or use it, you don’t need it.” . 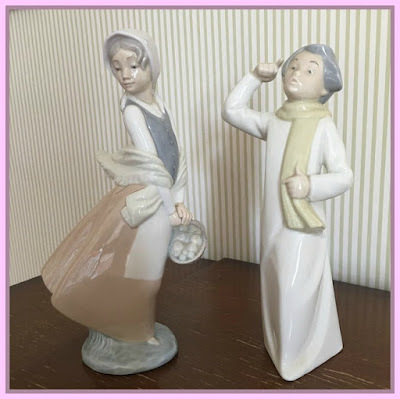 And there is also “if you buy something new, you have to get rid of something old.” The simplified life suits us, but I’ve never been a big collector....and I enjoy looking at posts about what other’s treasure...that’s a fun part of blogging for me. I know what you mean! I think eBay is the way to go, Maggie. The figurines are very pretty, though. Have a great week, friend! Your Lladro Nao ballerinas are so pretty. I think we are all in the same boat. I've started giving things as gifts on birthdays or holidays -- things I know that they want! I've also told each kid to come and tell me what they want and we will pack it up and send it off ... they haven't taken me up on the offer yet!!!!! I've given things away, sent to the church thrift shop and put some things in the garbage (yes, they were that bad). Enjoy them while you have them! Thanks for hosting! Have a great week, Maggie. Oh, Maggie, I know exactly of what you speak. I obviously fall into the catagory you mention. I've done a bit of everything you ask. I've given things to friends and family, I've sold a few things, and I've donated a large number of things to local thrift stores. Still there is more that languishes in boxes or on selves in the attic, most of it dishes and pieces of French faience. What to do with the faience is the major question. Some has been sent to an auction a few years ago, and other pieces sold here or there, but..... I know you understand. That said, I'm sure your figures could be easily sold on eBay or such. Perhaps one of your readers is interested in this lovely collection. Good luck, and thank you for hosting Mosaic Monday. Dear Maggie - Your Lladro dolls are so lovely. They reminded me of a Lladro pianist at my maiden home which was sadly broken in the midst of Hanshin Great Earthquake in 1995. I’ve been a fan of William Morris fabric but it was quite recently when I came to know this quote. I’m in the process of downsizing but can’t be completed little by little but must be done drastically. I thank to the things which pleased me for some time in the past and then give away to my relatives or friends who like them, while some go to trash. Dolls are thought to have protected family from disaster, so I’d like to send them to the temples for the repose of the doll’s soul. (Sounds strange? There are temples for dolls in Japan. ) Recently the toys of my grandchildren are here and there at my home. Drastic downsizing would be a little away. Maggie - with our recent number of moves, I can relate to your dilemma. I thought I was ruthless when we left Cleveland, but with each successive move I get more picky (who wants to dust all this stuff?) I have never sold anything on eBay; our kids request some items and the rest goes to charity! You have made the important first step - it's off the shelves and in a box! Thanks for hosting MM! Oh Maggie, your question is one I wrestle with all the time. I'm not a garage sale type. And I have a hard time parting with things. I felt very virtuous giving four boxes of theatre books to an eager and appreciative student last week. At some point, I hope the kids will want some of the things -- the silver, maybe some of the china -- or cousin kids. I'm donating a lot of clothing and household things and trying to find people who would want certain things (like that student) because of a passion. But it is hard. I figure within another 10 years or so, I'll probably move into the duplex on the other side of Rick. That should give me plenty of time, but don't count on it! Maggie, thank you for hosting your Mosaic Monday today. You shared an issue that is generational. We collected and now we have collections that we need to re-home. Finding a new home for personal collectibles isn't easy. None of the nieces want what I thought I needed when I was much younger - the 'good dishes and accompanying sterling tableware' let alone all the china, ornaments and so many other treasures. I donate and give away what I can but my Grandma's tea set that I turned into a completed dinnerware set and the first gifs of sterling tableware that I turned into place settings for 8 plus all the serving pieces weight on my mind now. I have ornaments from my Mom that are not in style but that I loved and still love. And the lists could go on. Maggie, Love that quote. I'm not quite there yet but working on it. 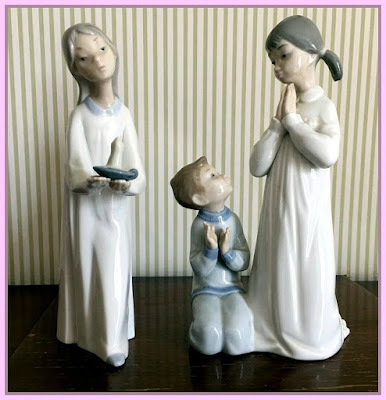 Sylvia D.
I very much admired the Lladro figures in the 80s and 90s. Funny how styles and our tastes change over the years. I've tried very hard to not collect too much of any one thing. We've moved so often that I've been able to keep most things pared down. I still have much of my china and my daughters have expressed interest in having some of it at some point. I would suggest e-bay for your pieces. I'm sure there is someone out there who is sure to love and admire them. They are charming! Thanks for hosting. i loved the quote so much and agree that keeping unnecessary stuff in house displays our mental illness because a healthy brain knows what is appropriate and needed and what is just to satisfy others that "see we have all these either "
Don't get me started on stuff and downsizing dear Maggie! Like most of us, I too have far too much when it comes to ornaments, knick knacks, china (especially antique dishware), and things from my mother and grandmother. My children don't seem to want much of anything I've loved over the years - but of course when I'm gone, along with the 'stuff' - which I will have to get rid of in the next few years, especially if we move - they'll wish they had it all most likely! I hope you find someone to love those beautiful dancing figurines.